The EPA-compliant Free Chlorine Analysis System uses amperometric sensor technology, eliminating the need for costly reagents. 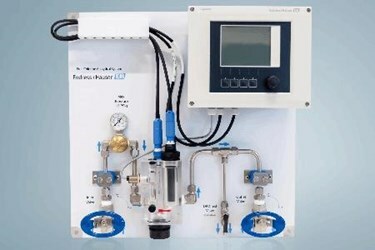 Endress+Hauser introduces amperometric Free Chlorine Analysis Systems, compliant to EPA Method 334.0. The systems eliminate the need for costly reagents and accompanying required maintenance, making the system ideally suited for applications in drinking water, industrial water, power and other industries where water is disinfected using chlorine. Each turnkey system is panel-mounted with an amperometric free chlorine sensor and a pH probe mounted in an integrated flow assembly, sensor cables, and an Endress+Hauser Liquiline transmitter, either the CM442 or CM444. An integral flow switch mounted in the flow assembly monitors for proper system flow, and provides an alarm at the transmitter if flow is interrupted. A lead-free regulator sets system pressure to 15 psi. The CM442 transmitter has two sensor input channels and two 4-20mA HART outputs, while the CM444 transmitter version comes standard with two sensor input channels, and can handle up to eight sensor inputs if desired, two 4-20mA HART outputs, and additional I/O, such as digital communications. Each transmitter has a NEMA 4X (IP66) rating and all other components are waterproof, making the transmitter suitable for installation indoors, outdoors or in an enclosure. System tubing is 3/8-inch stainless steel. All components are installed on a 20 x 20-inch stainless steel panel prepared with 3/8-inch ID mounting holes, for secure mounting to a vertical surface. Stainless steel inlet and outlet shut off valves, with 1/2-inch female NPT fittings, allow for system isolation during routine sensor maintenance. The pH-compensated measurement ensures accurate DPD verification, and a separate 1/4-inch sample valve allows a DPD verification test for residual chlorine to be performed without interrupting system measurement. The independent DPD verification test capability also ensures compliance with EPA requirements. A built-in needle valve in the flow assembly provides flow control between 30 and 120 L/hour, and an inductive low-flow alarm switch indicates when flow is too low for proper measurement. Both the free chlorine and pH sensors are industry-standard Memosens digital sensors that eliminate problems associated with analog sensor technology. The systems are equipped with a Cloromax CCS142D Memosens Free Chlorine sensor in ranges of 0.01 to 5 ppm or 0.05 to 20 ppm, while the Orbisint CPS31D Memosens pH sensor measures 1-12 pH. Optional Memobase Plus hardware and software enables intelligent sensor management. For more detailed information on the Free Chlorine Analysis System please go to www.us.endress.com/free-chlorine-panel. For further information, visit www.endress.com.